2013 Halloween Guide: Haunted Houses, Trick-or-Treating, & Spooktacular Seasonal Fun! Whether you’re looking for ghostly and hair-raising horrors, or a day of family-friendly Halloween fun, we’ve got you covered in with our 2013 Halloween Guide! For the 2014 Halloween Fun Guide, click here! Boo!!!! Halloween is a time best known for for dressing up in costumes and receiving candy from our neighbors and friends and scaring our loved ones senseless - all in good fun of course. The traditional holiday has become a part of American culture and sure has remained to be a fun day. 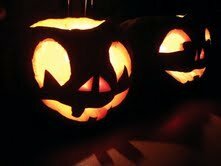 It is believed that Halloween originated with the ancient Celtic festival of Samhain, where the Celts would light bonfires, and wear festive costumes that mimicked the evil spirits to ward off roaming ghosts. The Celts thought that on October 31st, the portal between the dead and the living worlds was weak enough for the undead to travel through and cause havoc, especially on the living’s harvest. In addition, Christians observed All Saints Day, also known as All Hallows Eve, on November 1st and their rituals impacted Halloween. Gradually, the influence of American culture shifted and evolved Halloween to how we celebrate the holiday today. Children dress up in elaborate costumes, and get to be whoever or whatever they want to be. The little ghosts and ghouls or mini Supermans, Batmans, and princesses take on the persona of their costumes and show them off to everyone as they collect candy from door to door of their neighborhoods. Trick-or-treating is now a custom to the holiday. Homes are decorated with scarecrows, Jack O’Lanterns and other scary props. Kids decorate pumpkins with paint and a variety of faces. If your favorite holiday is Halloween, then you’re in luck - there’s plenty of scary-good fun happening this Halloween Season right here on Long Island. Celebrate the day of the dead by attending one of the many haunted houses or spooktacular events - this guide is packed with all of the thrills & chills you’re looking for this year. With numerous haunted houses on Long Island filled with ghost, ghouls and goblins, practice your screaming before hitting up one of these scream houses. Spook yourself up with a 15 to 20 minute walk while the undead lurks in the dark shadows. Don’t let your eyes fool in the dark. The haunt is open every weekend in October. See event website for specific times. Bayville Scream Park features 5 thrilling haunted attractions which include Bloodworth Haunted Mansion, Uncle Needle's Fun House of Fear, Temple of Terror, Zombie Pirates and Evil in the Woods! The park opens September 13th and will remain open until November 3rd. See website for specific dates, times and prices. As night falls, your worst nightmares come to life. Are you afraid of the dark? See event website for details on times. Watch your step! The undead are lurking in every corner! HV Asylum offers fresh actors and routines keeping returning and new visitors on their toes with 13 acres of terror. The haunt is open every weekend in October starting October 11. See website for specific times. With 13 rooms of shear terror, beware of your mind taking you to the dark place it should never go as live monsters roam in the shadows. See event website for specific dates and times. Feel chills go down your spine and keep your eyes open as you walk through the haunted house of evil featuring a dark collection of mazes and rooms. Where will your imagination take you? The haunt is open every weekend in October and the first weekend of November. See website for other days and times. The 4th annual Spooky Fest is held by the Center of Science Teaching and Learning and features something for everyone. This spooky fest is held on the weekends of October. See website for specific times. Experience the movie quality sets, bone chilling special effects and heart pounding scares. This haunt is open every weekend in October and some days during the week. Family Friendly hours 1pm to 5pm on Saturdays and Sundays. See website for information on specific times and days. Have every bone in your body chill as gruesome creatures roam in the dark night and souls haunt all who dare to walk in their path. Take a walk in the night through the trail of RISE of the Jack O'Lanterns featuring carvings from dozens of local artists and sculptors. Admission cost varies between $10 - $26. See website for more specific days and times. The Spooky Walk is a fundraiser for Camp Pa-Qua-Tuck directed towards children and adults with disabilities. Enjoy halloween with hamburgers, hot dogs, pretzels, candy apples and other refreshments to celebrate the camp’s 25th year of haunting. Don’t get squeamish! The walk takes place October 18th, 19th, 25th and 26th. See event website for specific times. Halloween is not all about being scared so enjoy a day of family fun Halloween at the Woodside Nurser with the “Octobercation" outdoor exhibit featuring face painting, scarecrow making and much more. There will also be the Haunted Tunnel with moving props and special effects perfect for those who are easily scared but still need a little scare. Dare to walk the trail of terror without jumping, screaming and running. With caves and blood-filled creeks, ponds and waterfalls, will you make it to the end? Find out and check out the event website for information on dates, times and pricing. Eat only factory-wrapped treats. Try not to eat homemade treats made my strangers. Carry a flashlight to help you see better as well as helping others see you. Many schools offer special programs known as Safe Halloween for the community where young kids can come together, dressed in their costumes, and go trick-or-treating door to door of classrooms inside the school. Spooky Fest at CSTL inlcudes a scary walk in the woods, live animals, a haunted maze of madness, merry monsters and so much more! Admission for adults is $15 and kids are $10. See event listing for specific dates. Come out to Stony Brook Village for its Halloween festival featuring a costume parade, trick-or-treating and a display of scarecrows created for the annual scarecrow competition. Have a haunted Halloween with a monster scavenger hunt, tales from the local grave digger, jack-o-lanterns, the legend of Sleepy Hollow, broom making and so much more! Call for more information. Bring the kids out for a day filled with free candy, face painting and raffles. Bring your Halloween spirit because a prize will be given for best costume. The Holbrook Fire Department is hosting their annual Halloween costume party fundraiser featuring a costume contest with prizes, DJ entertainment, raffles, buffet dinner and drinks. Halloween is not for everyone but there are still other scary and fun things to do to stay in the spirit of Halloween. Are you in the Halloween spirit?! What will you be doing this Halloween? Share it below in the comments! Want to share photos of your Halloween costumes and fun with us? Email them to photos@longisland.com, and we’ll add them to 2013 Halloween Gallery! Stargazing Spots, Hot Nightlife Fun, Events, News & More in August 9th's Newsletter! Over 50 Fair Returns to Long Island September 29th - Having Fun Never Gets Old! Halloween Happenings, Charitable Haunts, News & More in October 26th's Newsletter! Fun for the Whole Family - Rain or Shine! Subject: LongIsland.com - Your Name sent you Article details of "2013 Halloween Guide: Haunted Houses, Trick-or-Treating, & Spooktacular Seasonal Fun!"